We offer several products and information for keeping your pet healthy naturally! 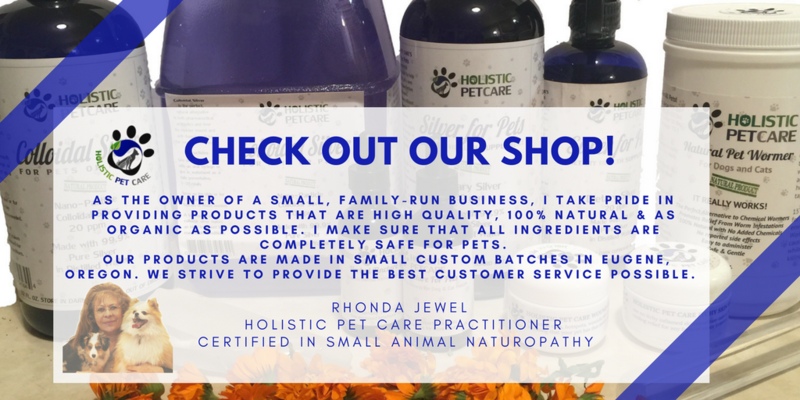 If you love your dog or cat like crazy and want the very best health care, you might want to try the holistic approach to wellness, helping your pets stay healthy, naturally. Avert those trips to the Veterinarian while building their immune system completely naturally. As it should be - as nature intended. Prevent parasites and germs, keep away dis-eases, help with restoring a natural balance & vitality for optimal health with holistic pet care. We are adding more products in the Homeopathy, Aromatherapy and Herbal Line- Hopefully Soon! Our pets can live and a long, healthy lifestyle up until their late teens and beyond - all the while they can stay well with a thriving vital and high quality healthy immune system and constitution, as well as a balanced mental and emotional well being. Our goal is to assist your pets to do just that with our information sharing, products, services and what we represent. Are you looking for a holistic supplement for your pet you don't see here? We recommended you try 'The Pet Health and Nutrition Center' for supplements, vitamins & herbs that we don't carry. Need any homeopathic remedies or other natural pharmaceuticals? Check out Natures Farmacy!